Good news! Apple now allows U.S. customers to download a copy of their data, months after rolling out the feature to EU customers. But don’t be disappointed when you get your download and find there’s almost nothing in there. Earlier this year when I requested my own data (before the portal feature rolled out), Apple sent me a dozen spreadsheets with my purchase and order history, a few iCloud logs, and some of my account information. The data will date back to when you opened your account, but may not include recent data if Apple has no reason to retain it. But because most Apple data is stored on your devices, it can’t turn over what it doesn’t have. And any data it collects from Apple News, Maps and Siri is anonymous and can’t attribute to individual users. 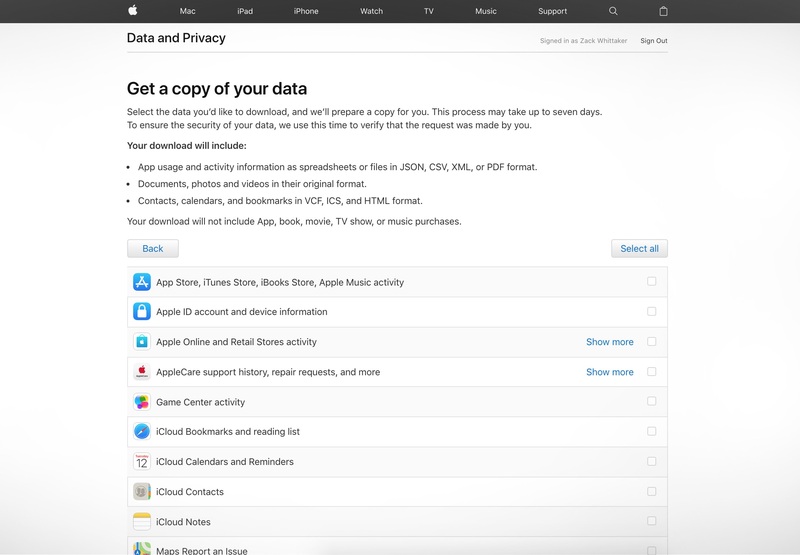 Apple has a short support page explaining the kind of data it will send back to you. If you’re curious — here’s how you get your data. You need to log in to privacy.apple.com with your Apple ID and password, and enter your two-factor authentication code if you have it set-up. From here, tap on “Obtain a copy of your data” and select the data that you would like to download — or hit “select all.” You will also have the option of splitting the download into smaller portions. Apple will verify that you’re the account holder, and may ask you for several bits of information. Once the data is ready to download, you’ll get a notification that it’s available for download, and you’ll have two weeks to download the .zip file. If the “obtain your data” option isn’t immediately available, it may still take time to roll out to all customers.